Using even less propellant than solar electric propulsion, zero in fact, is solar sailing. 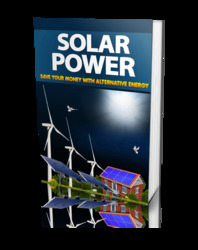 Rather than converting the Sun's radiation into electricity to run a rocket, a solar sail uses solar energy directly. Solar sails are large, ultralight, mirror-like sheets of extremely thin foil. As light is reflected, the light photons transfer some momentum to the sail as they "bounce" away. The result is that the light exerts a tiny force on the solar sail (a bit like making a toy car with a sail on top move by shooting little balls at it). The push is extremely small, less than a kilogram of force per square kilometer (0.8 pounds per square mile), so an enormous surface is needed to get any significant acceleration out of it. Somewhat like electric propulsion, the weak push acts continuously so that eventually a solar sail spacecraft could attain speeds several times faster than possible with traditional rockets. The continuous force of sunlight acting on a solar sail could also be used to put spacecraft into very special orbits that are not strictly limited to the orbital mechanics rules of Newton and Kepler. 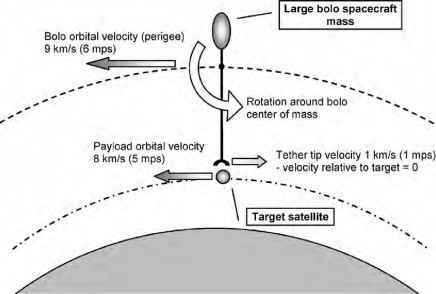 Instead of following a normal orbit, a very light solar sail may "hover'' in a fixed position with respect to the Sun and the stars, by balancing the Sun's gravity pull and light pressure push. In a similar way a solar sail may remain in a fixed position over the North or South Hemisphere of Earth, something that for normal satellites is only possible over the equator, in GEO (Fig. 2.7). 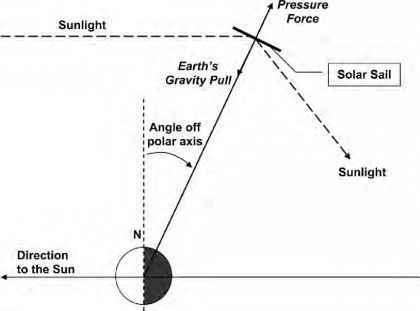 Figure 2.7: A solar sail could balance the Sun's gravity and light pressure to remain in a fixed position over Earth at high latitudes, rather than follow a conventional orbit. A big disadvantage, however, is that the Sun needs to be close enough for the sail to receive enough light; the further out into the solar system, the lower the acceleration. Beyond the orbit of Mars acceleration levels are too low for the practical use of solar sails (which does not mean solar sails cannot fly any further; as long as they pick up enough speed in the inner solar system they can fly well beyond Mars). Powerful lasers on Earth could help push a solar sail, but a laser also loses its usefulness over long distances because the small divergence of the initially tight beam becomes apparent. Part of the laser energy then flies past the solar sail and does not contribute to the propulsive force. Another big challenge for solar sailing is how to fold the vast surfaces of ultrathin foil in such a way that it fits inside the payload fairing of a launcher, and can still be deployed without damage once in space. Attitude control of flexible solar sails is also still a challenge. Finally, travel times with huge solar sails from one Earth orbit to another or to other planets are very long. Both NASA and ESA have made some deployment tests of small solar sails on Earth, and are studying demonstration missions to test deployment in Earth orbit. The Planetary Society, an organization of space enthusiasts in the United States, has already attempted to launch a privately financed test model, Cosmos 1. The spacecraft was designed and built together with the Russian Lavochkin Association and the Russian Space Research Institute. Unfortunately, the launch with a Volna rocket in 2005 failed and Cosmos 1 was destroyed, but the Planetary Society is preparing for a second try.